The sturdy stemmed plant grew to about 2 1/2′ tall with plenty of leaves to shade the peppers from the sun. This bell pepper grows on compact plants producing blocky, deep-purple peppers. The mild, sweet flavored peppers are loaded with vitamins C, A and beta carotene. Purple beauty matures to bright red. I grew one plant of several varieties this year, including red, yellow and chocolate-colored bell peppers. The purple beauty was the most prolific. Plant production really picked up after the temperatures cooled. Bell peppers don’t have to be staked. The stakes are just a precaution because a sudden wind storm can snap a loaded pepper plant. Purple Beauty – Capsicum annuum is thick-walled, mild flavored and juicy like all bell peppers. These shiny dark peppers turn green when cooked. Close your eyes and you can’t taste the difference between green, purple or red peppers. The purple pepper is so dark it looks black. All the peppers, large and small must be picked before the first fall frost. If there are more peppers than can be used fresh, chop and freeze them for winter use. I chop or cut the bells into strips and freeze. This assortment of frozen chopped peppers are perfect to add to soup, stew, chili and casseroles. Bell pepper strips are perfect to use in fajitas and stir-fry. I grew these black bells from Peaceful Valley organic seed. Heaps of peppers, a rainbow of colorful bells and every Anaheim and Poblano had to brought in before the first freeze. There are several ways to quickly preserve those peppers while they are still crisp and fresh. I canned a couple of half pint jars of roasted red peppers. Most bell peppers are chopped and frozen. Chilies are roasted, peeled, chopped and frozen into ice-cube trays. Yellow peppers will make a tasty golden salsa. Roasted red peppers are perfect for pasta dishes and antipasto trays. Chopped frozen peppers, can be dropped directly into pots of chili, vegetable soups and baked dishes. Roasted chili peppers will brighten winter casseroles, enchiladas, stews. These little Spanish peppers are usually fried in oil, salted and served as tapas. I first tried them in a restaurant and soon began a search for seed. They are easy to find in many seed catalogs. Padrón Peppers are picked when about 1 1/2″ long. They are cone-shaped and picked when very small, at about 1″ or 1 1/2″ long. They are pictured here with medium-sized red bell peppers for size comparison. Eating these snack peppers is a great garden party game. It’s “Spanish roulette,” nine out of ten peppers are mildly flavored. One in ten is a taste explosion in you mouth. Size is not an indicator of heat. You won’t know until you eat the pepper whether it is hot or mild. The look or size of the Padrón peppers offer no clues. The weather or time of the growing season is not a heat indicator. I grew Padrón peppers on the deck in 5-gallon buckets and in the garden along side other hot and sweet peppers. Next year, I’ll grow more plants because I love the taste of these tiny peppers. Heat a large skillet over high heat, add oil. Add peppers to the hot oil, tossing to stir. Cook for about 3 or 4 minutes or, until skins are blistered and peppers are softened. Transfer to a bowl, sprinkle with salt, and toss to coat. Sizzled in olive oil and sprinkled with salt, the flavor of these delicious peppers is down right tasty. Course salt will add not only flavor but also some texture to this simple summer appetizer. Padrón Peppers (Pimientos de Padrón) Ready to serve in 4 minutes. Buttonbush adds a new, fragrant and unusual flowering shrub to the home garden. ‘Sugar Shack’ is a buttonbush that is a show off shrub from summer through fall. Buttonbush Cephalanthus occidentalis is a native pollinator plant. Lovely, unusual pincushion flower attracts butterflies. White fragrant spherical flower heads are eye-catching and attract butterflies. Buttonbush is deciduous shrub with rounded habit. In its second year in my garden, it is about 5′ tall. Sweet white flowers appear as spherical flower heads in mid-summer. Flower heads look like a pincushion and are very attractive to bees and butterflies. Flower heads mature into hard, red colored, spherical fruits and stay attractive from late summer through the winter. Plants will tolerate wet sites and excess moisture. Sugar Shack may also be grown in patio containers. Plants bloom on new wood so pruning is best done in early spring. This is a Proven Winners plant that was sent to me for trial. I’m using this shrub as an anchor plant that provides a background for colorful annuals. The leaves are a full deep green, perfect to show off these unusual creamy white flowers. Peaches, blueberries and strawberries are blooming and beautiful this year. The raspberries and blackberries are not blooming yet. The tree is covered with pale pink blooms. You don’t need acres of land to enjoy home-grown fruit. My peach orchard is one dwarf tree. The blueberry patch is four containers on the steps of the deck. The strawberry field is a 4′ square raised bed. These soft pink flowers or the promise of peaches to come. Stark Saturn Peach is also known as a donut peach. The donut peach is a white fleshed freestone, just 2¼-2¾” in diameter. Sweet fruit and heavy producer the years we survive long, harsh winters and late frosts. Even without a peach crop, this beautiful peach blossom floral display every spring is reason enough to own this tree. I got my peach tree from Stark Brothers. The tree is about 8′ tall. Because it is a self-pollinating tree, Stark® Saturn Peach is a great choice for small space gardens. Scarlet red Ozarks Beauty is ever-bearing with a heavy, first wave of fruit. It should continue with a light production of berries through frost. After that early flush of fruit, strawberry production in my garden becomes occasional. Usually the wildlife score these occasional berry before I discover them. I started with 25 plants in a 4′ x 4′ raised bed with one 3′ x 3′ tier. Plants were sparse. In this third year, the beds are lush and full of plants covered with blooms. It can take 2-3 years to really produce a good crop. So, this is the year! Maybe, in addition to strawberry shortcake, there will be enough for a small batch of strawberry freezer jam. Get strawberry plants from Stark Bro’s, Gurney’s, or Jung Seed. These beautiful white blooms promise to produce berries with that old-fashioned wild blueberry flavor. Blueberries blooming in containers on the deck. Four containers of dwarf Tophat Blueberry plants are growing on the steps of the deck. In the second year on the deck, we had a mild winter and the blue berry bushes are all blooming this spring. If I don’t cover them, I’m sure the berries will be bird food. I’m looking forward to picking a few full size ripe berries while sitting on the deck. The plants will get no more than 2′ tall. I the fall, I’ll prune my spindly plants to encourage them to get bushy. These plants are from Gurney’s . You can usually get the dwarf bushes, from Jung or Stark Bro’s. Picking a perfectly ripe, sun-warmed peach from the tree, gathering a hand full of the juicy raspberries, or popping a whole, sweet strawberry in your mouth is the essence of summer. Home grown fruit is the best fruit you ever tasted. If you are fortunate to have extra fruit, make a jar of two of homemade jam. That jar of summer jam will need little or no sugar. Home grown fruit is grown for flavor. It’s fragile, and meant to be eaten soon after harvest. Fresh fruit is the most nutritious and tender produce you can eat. Stark Bro’s has been around since 1816. I’ve bought several fruit trees from Stark over the years. It’s a reliable company that stands behind their products. The confidence-building growing guides will get you started with home-grown fruit. During the Stark Brothers 200th Anniversary, you can get some very good fruit trees and berries for under $20. Green beans are in a small patch we must collect a few pickings for a meal. In a couple of days, cucumber production will explode. For now, there are enough cucumbers for fresh eating. There are plenty of Sun Gold cherry tomatoes for salad every day. The few red slicer tomatoes from My Garden Post were used for the first BLT of the season. Summer harvest of onions and garlic. is all about the first juicy red tomatoes of the season. Those early full-sized tomatoes were grown on two foot tall plants! Bush 506. First full size tomato to ripen, 5-oz. The dense clumps make for good cut flowers. Color Spires® is a perennial Salvia. You may have to rethink what you know about the annual salvias that must be planted every summer. 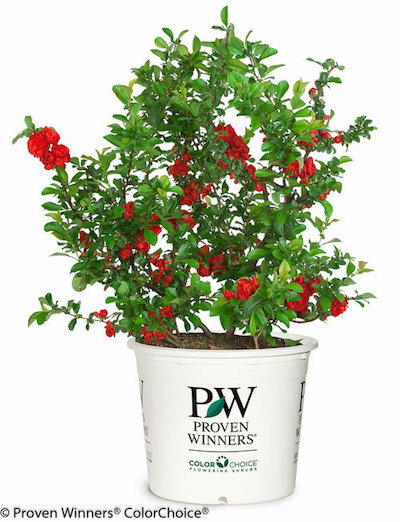 There’s room for this new Proven Winners introduction in the garden or, it is beautiful and lush in containers. ‘Crystal Blue’ produces a full mass of light blue flowers in late spring/early summer. The humming birds and butterflies are attracted to this rounded clump of spiky blue blooms. Thick flower stems rise above the dense, rounded clump of textured green foliage and remains attractive all season. This second year in the garden has moved up Color Spires® ‘Crystal Blue’ on the list of favorite salvias in the garden. I love Salvia and now that there are such hardy and beautiful perennial varieties, I plan to include Color Spires® Perennial Salvia in several garden spots. Color Spires® ‘Crystal Blue’ Perennial Salvia is the asset you have been looking in your blue flower garden. True blue flowers are hard to find and this one will be around for years to come. Color Spires® ‘Violet Riot’ Perennial Salvia will also blend into the blue garden beautifully. Since my back yard is the neighborhood bunny park (Like a dog park but for bunny rabbits.) All the Color Spires® are rabbit and deer resistant. These Salvia are drought tolerant and heat tolerant. Is in the garden centers now. It is exploding with lavender blooms. Lush and full with textured medium green leaves. I’d have to say they thrive with neglect in my garden. ‘Crystal Blue’ Salvia is the first of its kind, most perennial Salvias are darker purple, so this is incredibly unique to have a light sky blue Salvia. At 18-24 high and about the same width, it is a neat, orderly plant. A pretty focal point in a perennial cutting garden, a butterfly garden, or all blue perennial bed. This is a reminder of what every gardener knows. Be Patient. Don’t give up on plants, especially those perennials. That first year, your newly planted perennial is busy establishing roots. It just keeps getting bigger and more beautiful every year. A small version of a butterfly bush that blooms all summer. Attractive to butterflies, hummingbirds and bees, but deer resistant. Growing only about two feet tall with silver-green leaves, this butterfly bush is small enough for container planting or in a perennial garden. The Blue Chip in my sidewalk border has not had any insect or disease problems. No need for deadheading or pruning. This dark and rich red petunia is a hummingbird magnet. Look for this new Black Cherry bloomer next spring. Black Cherry is self-cleaning, meaning no deadheading. All hanging baskets require regular watering to thrive. Plan on watering daily during the hottest part of the summer. Or, consider setting up a simple irrigation system. Start with a slow release fertilizer when you build your baskets. Give the new roots plenty of moisture holding soiless potting mix. Black Cherry makes a beautiful in a hanging basket. It slightly mounds in the basket and then tumbles over the edges, spilling nonstop blooms over the basket Spring to first frost. Proven Winners sent Supertunia® Black Cherry Petunia and several other plants for trial. I love the rich colored flowers that draw butterflies and hummers all summer. Once these petunias are available locally, I can imagine a row of these hanging baskets bringing birds and butterflies to the patio. Black Cherry Petunia hybrid is one of the newest Proven Winners Supertunias®. Make a note to look for Black Cherry in the spring. I am also looking forward to seeing the new Supertunia Indigo Charm. Here is a preview. Last year I had a trial sample of a Torenia hybrid that was meant for shade. Once I found a shady place for it, I kind of forgot about it. is a plant Catalina® Grape-O-Licious Wishbone Flower (Torenia hybrid) I learned just what a valuable landscape plant this is when I visited the Overland Park Arboretum & Botanical Gardens. This plant is so much more versatile than I imagined. It was planted in shade, but also part shade and part sun. This low growing annual spreads out along the sidewalk, as a beautiful groundcover and splash of color that could compliment an endless variety of gardenscapes. Grow a variety of carrots to discover which grow best in your garden. Grow carrots in the spring garden and again as a fall crop. If you ever wanted to grow carrots, fall carrots are planted in August or early September in my neck of the woods. (Zone 6A, Southern Missouri, USA.) I get carrot seed at Nichols Garden Nursery. Nichols Garden Nursery has a big selection of carrot seed. The seed is very affordable. That bargain price tempts me to try an assortment of carrots. Check out their online catalog, if you are tempted to grow fall carrots. July and August are the time to order seed and get carrots growing for a fall harvest. If stored properly, carrot seed can be used for up to three years. Some days it looks like my back yard is a nature sanctuary for rabbits. They eat and sleep in my garden when I am not vigilant. When I do remember to turn on the Scarecrow motion-activated sprinkler, the rabbits stay away. The Contech Electronics scarecrow motion-activated sprinkler is a humane animal deterrent. The scarecrow detects and sprays any animal movement within a 1000-square-foot area day and night. When I do not remember to turn off that little water blast, I suddenly get hit with a refreshing spray. It’s more fun than some of the carnival rides at the state fair. Especially when it is a surprise. Read more about carrots: How to troubleshoot problems growing carrots and cabbages and University of Missouri Extension, Frequently Asked Vegetable Questions is very helpful. Extension recommends planting a 5 to 10 feet per person for fresh eating. Plan to grow 10 to 15 feet per person, if you are going to process carrots for year round eating. Bright orange Baltimore Carrots picked 6″. Baltimore carrots are beautiful, bright orange carrots. They are sweet and crunchy. These carrots are about 6″ long. Harvest Carrots: any time their color is bright. This is when their flavor and texture are optimum. Carrots can tolerate a light frost. Irrigate well the day before harvest to ensure the roots have absorbed their maximum capacity of water. Store at 34°F and 95% relative humidity. All of these carrots were pulled up at one time. They ranged in size from 2-inches to 8-inches. I’ll toss the baby carrots into a mixed vegetable refrigerator pickle jar. I like raw carrots. Homegrown and picked after only a couple of frosts, carrots are sweeter than any grocery store carrot you have eaten. Cooked carrots have their advantages. Some of the nutrients in lightly cooked carrots are more available to the body than the raw carrots. Cooking carrots will break down the tough cellular walls of carrots, making some nutrients more useable to the body. The first batch of full-sized homegrown carrots, are a celebration of carrot growing success. That means carrot cake or morning-glory muffins. If there are more fall carrots, they will go into beef stew, vegetable soup, pot roast. So, come grow carrots with me this fall. If you grew up with a clay soil garden, You’ve probably never had much success with carrots. But building a raised bed for your raised bed, well that is a carrot’s dream come true. In this Missouri Gardener Magazine story, I write about carrot boxes. That is the secret to long straight carrots. Build a raised bed fast! Yaya carrots had the widest size range. All the seed was sown at the same time. If I could have left these Yaya carrots in the garden, it would have been great to stretch out the carrot harvest over a few more weeks. 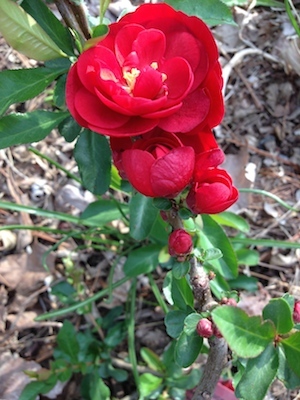 This is the second spring for this shrub in my garden. I prune it right after it blooms. The first year you plant a shrub, there’s not much to say about it. 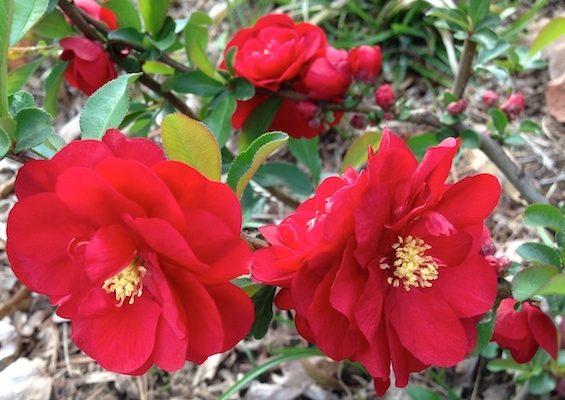 This is the second spring the Scarlet Storm has bloomed in my yard. In coming years, I expect this Quince to be even more beautiful. It can get up to 4 feet tall and wide. If you go to the expense of buying a perennial shrub, dedicate some time to getting it off to a good start. Plant it properly and keep it well watered. Once your shrub is well established, it requires very little attention. Type in your zip code at the Proven Winners site to find out where you can get it locally.